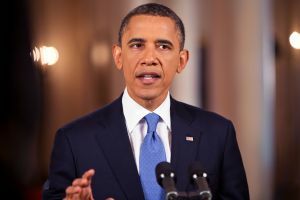 In an intended off-the-record speech at MIT’s Sloan Sports Analytics Conference, later released by the libertarian publication Reason, Obama expressed concerns that Americans are living in “entirely different realities.” Obama cited Fox News and the New York Times specifically when noting that major news stations report entirely different facts to fit the “Balkanization of our public conversation.” Social media platforms, he said, exacerbate that trend. The former head of state isn’t the only person calling out social media’s dangers lately. A former Facebook executive suggested the platforms have become “tools that are ripping apart the social fabric of how society works.” The ongoing investigation into Russia’s meddling in the 2016 election has drawn significant attention to the role Facebook and other platforms played. Fixing the problem, especially before the 2018 election, won’t be easy. A U.S. senator recently suggested that Congress might have to get involved, even going so far as to levy fines against platforms that don’t do enough to crack down on bots.